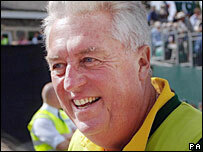 Since the transmission of this programme, Jamaican police have attributed the death of Bob Woolmer to natural causes. Due to rights restrictions with the sports clips, we are unable to show this programme online. Pakistan's cricket coach Bob Woolmer, who died of strangulation earlier this year, was also poisoned, a BBC investigation has learned. was rendered helpless before being strangled, the Panorama programme says. Woolmer's murder in March during the Cricket World Cup in the West Indies cast a shadow over the tournament. 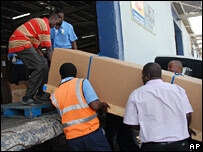 His remains were flown back to his home in Cape Town in South Africa on Sunday. The casket, which had been sealed in a large wooden crate, arrived on board a commercial flight to Cape Town's International Airport from Jamaica. He was found dead in his Kingston hotel on 18 March, the day after his side lost to Ireland in the World Cup. A post-mortem examination said he had been strangled. On 20 April the inquest into the death was postponed because the coroner was advised there had been "recent and significant developments". Now a Panorama investigation has learned that a toxicology report on Woolmer's body shows that there was a drug in his body that would have incapacitated him. The final results of the report are due to be given to Jamaican police next week. "Those tests will show there was a drug in his system that would have incapacitated Mr Woolmer," Panorama's Adam Parsons says. "It now seems certain that as he was being strangled, he'd already been rendered helpless - leaving him unable to fight back. The policeman leading the murder investigation, Mark Shields, told Panorama that it is "difficult and it's rare" for one man to strangle another. "A lot of force would be need to do that. Bob Woolmer was a large man and that's why one could argue that it was an extremely strong person or maybe more than one person. Family spokesman Gareth Pyne-James told the Associated Press news agency that Woolmer's funeral in South Africa would be a private ceremony. "Arrangements have been made and the family will decide whether it's going to be an interment or cremation," Theo Rix, from a local funeral home, told Reuters news agency. Panorama: Murder at the World Cup will be broadcast on BBC1 at 20:30 BST, Monday, 30 April.